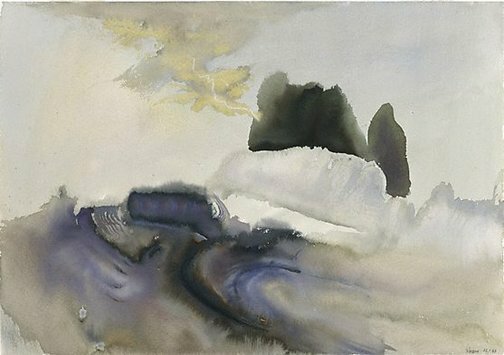 Before embarking on the oil paintings of the 1980s, Gleeson made a series of drawings in watercolour and pastel, experimenting with different mediums in order to ascertain which served his working process best. He soon came to reject the use of colour in his preliminary drawings, as it confined him too rigidly, at too early a stage, in the overall process. '... I hadn't worked much in watercolour and just for a year or so I had a spate of watercolours, followed by a spate of pastels ... Basically I was trying to discover what I could do with watercolour. I knew what I could do with oil paint, but I wasn't sure what I could do with watercolour. And they were experiments really, in discovering its mysteries and its possibilities. And the same with pastel. I was fascinated by Degas' pastels, the way he crusted them on, and I was interested in giving them that sort of textured quality', Gleeson quoted in Renée Free's unpublished catalogue of James Gleeson's work. Hendrik Kolenberg and Anne Ryan, 'James Gleeson: drawings for paintings', Art Gallery of New South Wales, 2003, pg. 77. Signed and dated l.r., watercolour "Gleeson 15.1.83". Hendrik Kolenberg, Look , 'Revealing drawings: ideas that were turned into monumental paintings', pg. 22-26, Sydney, Mar 2003, 24 (colour illus. ).